I would like to share with you the keys to true success. Success isn’t based on winning gold medals, achieving fame and fortune. True success is something much deeper. It has to do with the heart and what you make of yourself when you face difficulties, trials, and setbacks. The people of Tohoku have faced a tremendous amount of hardship from the devastation of the earthquake and tsunami. I cannot begin to comprehend the scope of what many from Tohoku have experienced. However, I know that true champions can and will emerge from the most devastating of circumstances. Although my story cannot compare to the pain many have experienced, I want to share my journey as an Olympian, and how you can become a true champion in life even in the midst of failure and defeat. 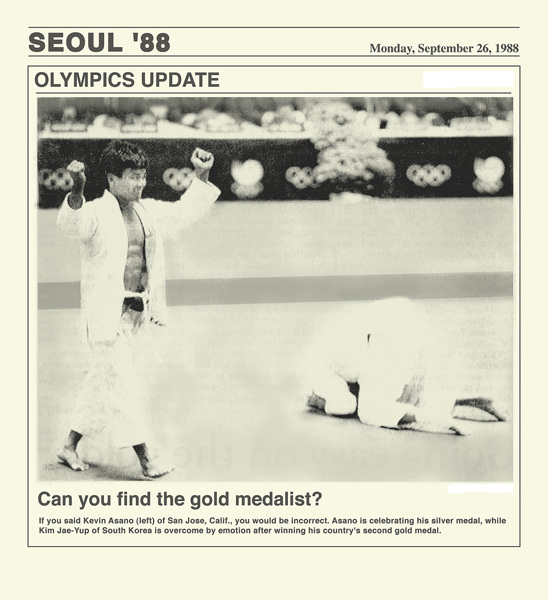 In 1988 I had the opportunity to compete at the Olympic Games in Seoul, Korea. On the day of my competition, the arena was filled to capacity with over 7,000 spectators. In the center of the arena, the lights and cameras focused on one competition area. After 18 years of training I could not believe I was about to compete at the greatest sporting event in the world. A few minutes before I stepped onto the mat, I heard a small still voice in my heart clearly say to me, “Kevin, you are going to do well today.” I was so overcome by with the words that tears welled up in my eyes. I quickly slapped my face to focus on the match. It would not have been good for me to walk onto the mat with tears in my eyes as my opponent was ready to tear me apart. After this spiritual encounter, I was ready to step onto the mat! As the announcer called my name and I walked onto the mat, thousands of the Korean spectators booed me. What was this all about? I had never been to Korea before and yet these people booed me. I pushed the negative thoughts aside and engaged in my first match. After I won my match I waved at them. I wasn’t going to let their booing ruin my time at the Olympics. The second and third matches were the same. I stepped onto the mat, the Koreans booed me then I won and I waved to them. There was no sense in me getting upset over something that was beyond my control. Seoi Nage throw in the first round. Amazingly my opponent spun out of this throw and landed on his stomach for no score! After four rounds of stiff competition, I found myself in the finals, fighting for the gold medal. Of all the competitors I could have faced, my opponent was the Korean champion. The whole arena came alive with cheerleaders waving pompoms, flutists, flag wavers and Taiko drummers. When they called us onto the mat all of Korea began stomping their feet and chanting his name in unison to the beat of the drum, “Kim Jae Yup, Kim Jae Yup, Kim Jae Yup!” The noise was so deafening that it sounded like they were chanting, “Kill That Bum, Kill That Bum, Kill That Bum!” I was the bum they wanted to kill. We started the match and we went back and forth with no score. After about three minutes we went into newaza and as my opponent attempted a choke. I grabbed his fingers like this to stop him, and the referee gave me a shido penalty. Many thought it was an unwarranted penalty but nevertheless I was behind in the match. For the remainder of the match I desperately fought to win but to no avail. When the buzzer sounded to end the match, the Korean fell to his hands and knees, overcome with emotion for winning the gold medal. The crowd exploded into thunderous applause and cheers. As I walked back to my starting line, it was as if my 18 year judo career flashed through my mind in a moment. From a seven year old boy starting judo, through junior high, high school, college, and to finally standing on the mat at the finals in the Olympics. In a split second the thought went through my mind, “I’m standing here at the finals of the Olympic Games. I wonder what it feel like to be an Olympic champion?” During my training I had always envisioned myself raising my hands after winning the gold medal. I had just lost but this was my one and only chance to see what it felt like to be a winner. Even though I had lost at the finals at the Olympics, I felt like a gold medalist in my heart. I realized that it’s not what happens TO you that makes you a champion, but what happens IN you that makes you a champion. What happens when you face difficulties, failures, or defeats? Do you give up and call it quits or do you fight on? When you are overcome by fear do let fear paralyze you or do you move forward with courage in the face of fear? True champions are not are not those who win gold medals, but those who will find their dream, step onto the mat of life and fight with all their heart to pursue their dream. Through my journey to the Olympics, let me share with you the three keys to obtain true success. To help you remember the three keys I have a bookmark as a present for each of you. 1. Seek Out – Discover Your Dream. Within you lies an incredible dream. This dream is not something that you determine for yourself. It is something that you are born with. It is your privilege to discover what that dream is. If you never find your dream you will live a mediocre and unfulfilled life. When I was a young boy, my aunty gave me a Japanese 1,000 yen coin that commemorated the 1964 Tokyo Olympics. 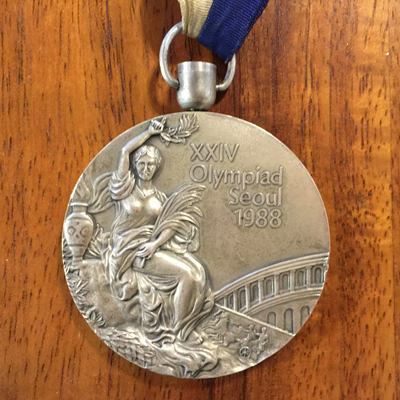 As I looked at the coin, I dreamed for the first time of competing in the Olympic Games. Over the next 15 years the dream grew stronger and stronger until the dream became a reality. What is your dream? What significant thing do you want to do in life? Search deep in your heart and you will find your dream. Don’t let anyone tell you that you are insignificant. Inside of everyone of you lies greatness. You need to discover what it is. A dream will only remain a fantasy until you act upon it. Many times fear and doubt stops people from pursuing their dream. They listen to the lies that they are not smart enough, they are not good enough, or that they do not deserve success. Maybe it’s the fear of failure or the unknown. Whatever it is the battle is in your mind. You need to courageously face your fear, wipe away your doubts and step out with faith and confidence. In order for me to fulfill my dream, I needed to take the first step of my journey to the Olympics. Like my great-grandparents who left Japan to pursue a better life, I needed to leave Hawaii and come to Japan to pursue my dream. Some people said I was too small and too weak, and I would never go to the Olympics. Instead I listened to my heart and stepped out on my dream. Once you discover your dream, you need to dare to step out and pursue it. You don’t want to look back on your life and regret that you never pursued your dream. If you never try, you will never succeed. What do you have to lose? Go for it! The greater your dream, the greater the obstacles you will face. Many people start off toward a dream with great excitement and intentions but when the road gets rough they give up along the way. They allow failure and discouragement to stop them from pursuing their dream. The person who perseveres through the hardships and setbacks is the person who will eventually find success. When I came to Japan I trained at Tokai University. I quickly realized that I was the smallest and weakest man on the team. Everyday for two years I was mercilessly pounded and beaten by my teammates. After a few months I lost my self confidence and wondered to myself how I could ever dream of going to the Olympics, let alone win a medal? Every time I became discouraged and wanted to quit, a small still voice inside of me kept urging me not to quit. It was the same voice I heard at the Olympics that told me I would do well that day. My dream to go to the Olympics was more than just a personal goal. It was something I needed to pursue in order to fulfill my purpose in life. If I had given up along the way, I would have missed out on my Olympic dream and wouldn’t be standing in front of you today encouraging you to pursue your dream. One of my students is an example of a true champion. 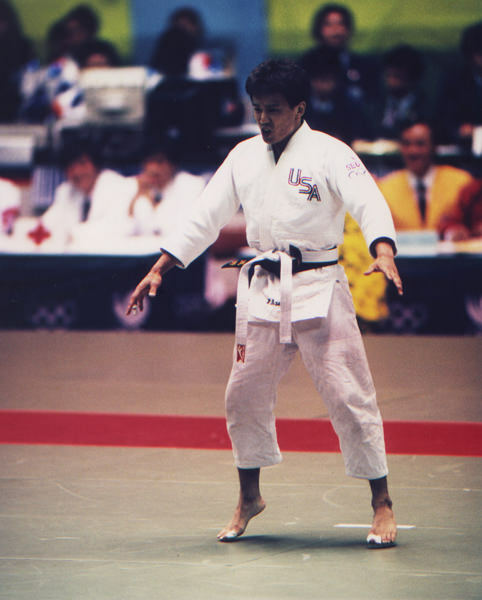 Matt Ogata started judo when he was 7 years old. He was an average player who hardly won championships growing up. 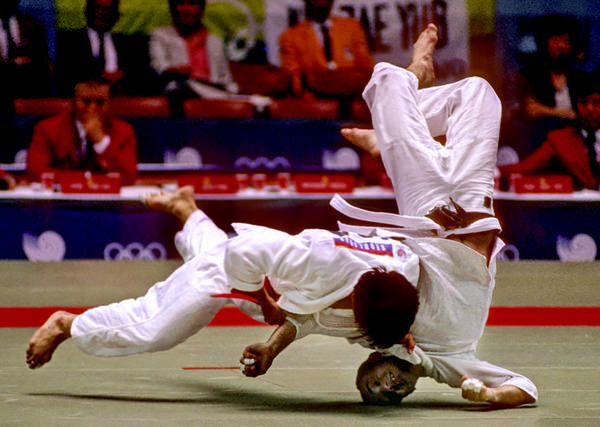 In Hawaii most judo players retire from competition after high school to pursue college or work. For Matt it was different. 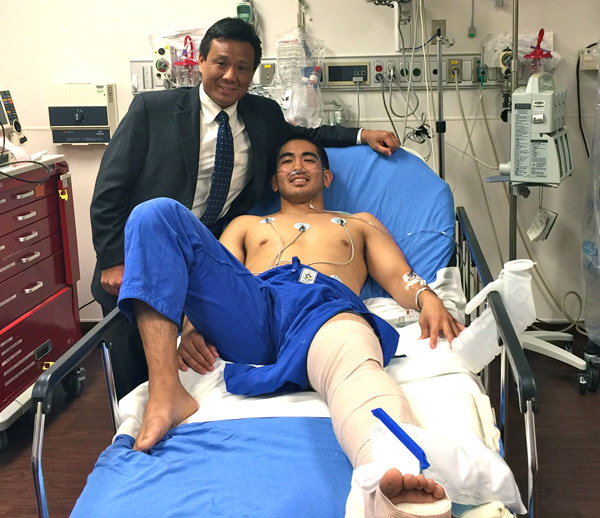 He felt a strong urge to continue judo and compete at the elite level. He won the Collegiate Championships two years in a row but his dream was to win the Senior National Championships. This past May he entered the Senior Nationals and won his preliminary matches. In the semi-finals he dominated the match and with 20 seconds left it looked like he was on the way to the finals. In a desperation attempt his opponent came into a throw and Matt tried to twist his body to avoid a score. As he turned his foot got stuck in the mat, and he dislocated and broke his ankle. As he lay on the mat in shock and pain, the audience grimaced as we saw his foot hanging and disfigured. 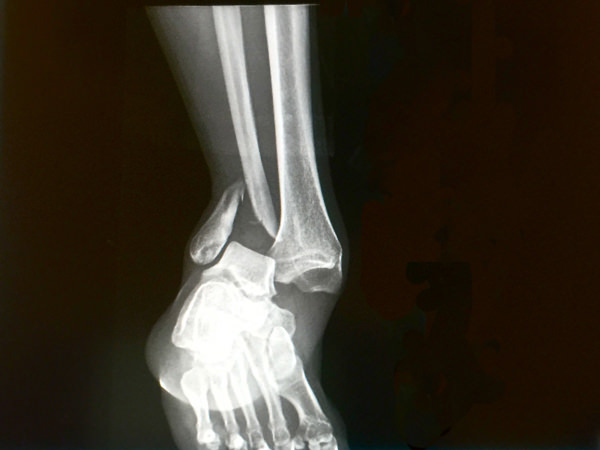 In my 45 years of judo, I have never seen this bad of an injury. Matt begged the doctor to let him fight out the match. Instead he had to forfeit the match and was taken by ambulance to the hospital. But more than a physical injury, his heart was broken from a shattered dream of losing his opportunity to win a national championship. But is Matt a loser and a failure? Whether he ever wins a medal, in my mind he is a true champion. He discovered his dream, dared to pursue his dream, and never gave up on his dream. I don’t know where you are in your life. May be you are still trying to discover your dream. Maybe you know your purpose but you need to dare to step out on your dream. Maybe you are pursuing your dream but you are tired and feel like giving up. Where ever you are in your journey to true success, remember that its not about what happens to you that makes you a champion. It’s about what happens IN of you that makes you a champion. Find out – Discover your dream, Step out – dare to pursue your dream, and Stick it out – never give up on your dream. When you do true success will be your reward.